SIG Combibloc is unwrapping a $3.7 bln Swiss listing. Record sector valuations have helped owner Onex more than double its money in almost four years. Growing demand and green credentials should allow the Tetrapak rival to deflect concerns about a crackdown on throwaway plastic. 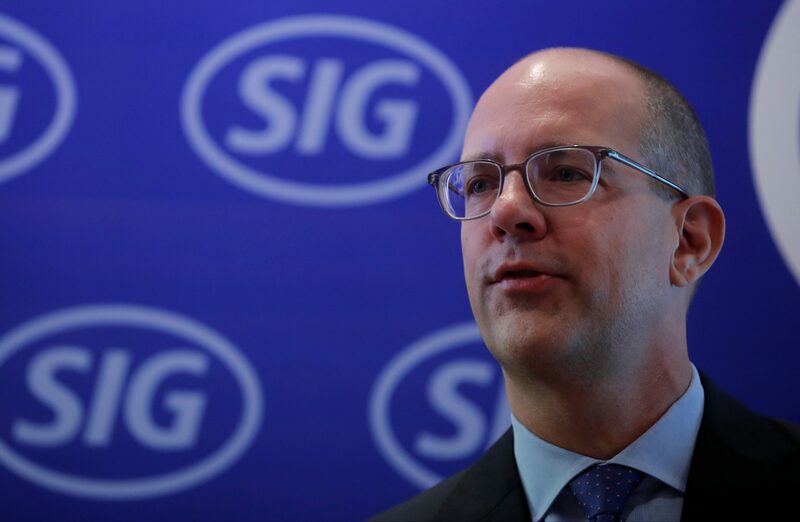 CEO Rolf Stangl of Swiss packaging maker SIG Combibloc displays a product as he addresses a news conference in Zurich, Switzerland September 17, 2018. SIG Combibloc set the price of its initial public offering at 11.25 Swiss francs per share ahead of its market debut on Sept. 28, valuing the Swiss packaging maker at round 3.6 billion Swiss francs ($3.7 billion). SIG, which makes aseptic drink cartons for milk and juices and is a competitor to industry leader Tetrapak, is selling shares equivalent to about 41 percent of the company’s enlarged equity, or up to 47 percent if its owner exercises an overallotment option in full. The company expects to raise approximately 1.14 billion Swiss francs from the offering, after expenses, and will use part of this sum to reduce its net debt of around 2.6 billion euros. Private equity firm Onex, which bought SIG Combibloc in 2015, is expected to retain a stake of more than 50 percent. The company reported sales of 1.7 billion euros and adjusted EBITDA of 480 million euros for the 12 months ending June 30, giving it an adjusted EBITDA margin of 29 percent.